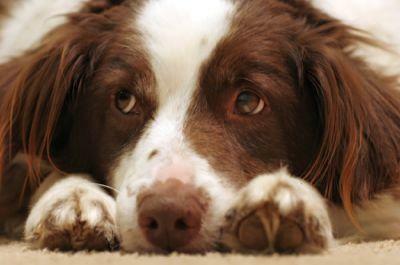 Just like people, dogs have to fight cabin fever so boredom doesn't lead to behavior problems caused by pent up energy. Let Pet Lifestyle Advisor and author Wendy Nan Rees help you keep your dog entertained when the weather turns harsh. When the weather is cold and snowing or raining, what can you do on those days when Fido will just not leave you alone? I've sometimes had this problem with my dogs Senny, Cappy and Little Man. We recently had five days of rain, and by the fifth day my boys had just hit the wall. They had gone out every day for short walks, but they just had not had the regular play time they're used to. I realized I needed to do something for them. When your dog is inside too long because of weather or any other reason, the best thing to do is find something to occupy his mind and body for a while. This way, he gets a full workout. During times like this, I hold a training lesson and I teach a new trick; something that is fun for both of us. It's a great way to make my bored doggies happy and get them off the couch. So, what kind of trick can you teach? The best thing to do is watch your dog when you are playing with him or giving him a treat. See which behavior he seems to perform naturally on his own, and then you can use that as the basis for your trick. Here's an example for turning a natural behavior into a learned trick. Whenever my dog Little Man wants a treat or wants me to play with him, he wags his tail, stretches out long and crawls to me to get attention. This is an example of a dog doing something naturally that you can build on and turn into a trick. So, I used the verbal cue "crawl" to encourage the behavior. During your own training sessions, you'll work your dog both physically and mentally. This will really help release pent up stress. So, watch your dog and find something he does naturally. Next, assign a verbal cue and a hand signal to that action. It could be crawling, rolling over, dancing on his hind legs- whatever he feels inspired to do naturally. Once you have your verbal cue and hand signal, it's time to bring out your dog's all-time favorite treat. I like to use hot dogs (The only time my dogs get them is during training). Now when you show your dog the treat, watch for one of those natural behaviors. If he happens to dance on his hind legs for the treat, choose the verbal cue "dance," and perhaps hold the treat just out of reach of his nose but move it slowly in a cirle so he'll spin to follow it. Practice this, and soon your dog will associate "dance" and making a circle with the treat as a signal to perform his little trick. The point here is to find something easy for your dog to do and then build it into a trick. Keep it fun your dog and let him have the treat occasionally during the training so the session remains fun for him. Your dog gets a great workout, and you get to have a little peace once he's worn out. Have fun!